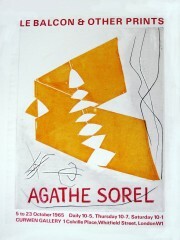 Agathe Sorel, printmaker, sculptor, and teacher, born in Hungary. 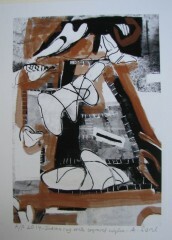 After arriving in England in 1956 she continued her studies at Camberwell school of Arts and Crafts. 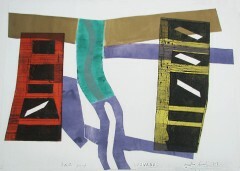 After which she worked with S.W.Hayter at Atelier 17, Paris, 1958-1960. 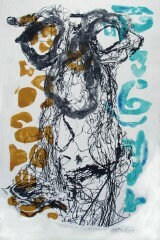 She worked as a Part time lecturer at Camberwell, Maidstone, Goldsmiths, Canterbury and Royal Colleges of Art , Slade school of Fine Art and Philadelphia Museum of Art. 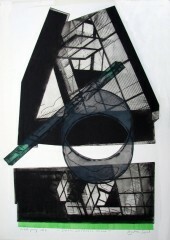 Sorel was a member of RE and of the Printmakers Council, being its chairman 1981-3, was on the council of the Royal Society of Printmakers, helped select 8th International Print Biennale in Bradford and founded the Studio of Contemporary Art training Centre. She was awarded a Gulbenkian Scholarship, 1958-60, and the Churchill Fellowship in 1966-7 to work in America and Mexico. 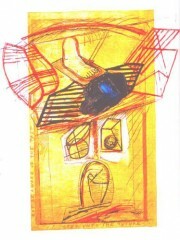 She has her work in various renowned Institutions such as : The Tate Gallery; Victoria and Albert Museum; Arts Council of England; British Museum; Royal College of Art; British Council; South London Gallery; Government Art Collection; Ashmolean Museum, Oxford; Fitzwilliam Museum, Cambridge; Taylorian Institute, Oxford; The London Institute; British Library.